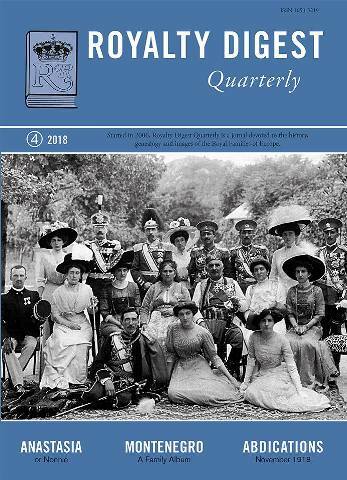 The front cover of the latest issue of Royalty Digest Quarterly (no. 4, 2018) is blue and beautiful, and in the photo we can se the royal family of Montenegro in around 1910, the year when the principality was declared a kingdom. I have happy memories of my visit to Montenegro and the former capital of Cetinje in 2009. I will come back to this later in the blog article. So, what is on the mind of the editor, Ted Rosvall, this time? He starts with mentioning the 100th birthday of Princess Woizlawa Feodora Reuss and then lists other royals (by birth or by marriage) who reached the same milestone. Members of royal as well as princely and mediatized families are included. Strictly speaking I wouldn't have included Elsa Cedergreen, née Bernadotte Countess of Wisborg, as she was only a decendant of the Swedish royal family, but I will leave it at that. The first article, 'The Blue Flower' a Romanian Mystery, is written by the magazine's historical consultant, Charlotte Zeepvat. She writes about, and make extracts, of a collection of postcards signed by «Floare Albastra».While her identity is never disclosed, she obviously was close to the Romanian royal family and court. Then Ove Mogensen follows up with the second part of his series Tombs, Graves and Monuments. Burial Places of the Bonaparte Dynasty. My, my, hasn't he been all over the place! Would love to visit some of the places as well as the graves he has visited. The front cover photo obviously reveals which royal family Charlotte Zeepvat will cover this time in her Family Album series. I find the history of the former royal familiy of Montenegro to be one of the most fascinating ones, and once again I cannot say how much I enjoyed my visit in 2009, three years after the former monarchy regained its independence. Following a 3 pages long historical introduction, the readers can enjoy 61 illustrations besides the photo of the royal palace and a map. And of course, there is a genealogical table as well. Here is a small collection from my own visit to Cetinje in 2009, the first two shows the royal palace, the third was taken of the chapel in which King Nikola I and Queen Milena were reburied in 1989. I was not allowed to take photos inside. The last two photos show the birth house of King Nikola in the village of Njeguši. There is a museum inside. Photos: © 2009 Dag Trygsland Hoelseth. The royal palace in Cetinje is open for tours, but you are not allowed to visit by your own, only groups are allowed. At least that was the case in 2009. So I had to wait half an hour or so until a group of Russian tourists arrived and I could join them for the sightseeing. I was the only one who left money in the book shop, though. I bought lots of cards as well as the book The Court of King Nikola by Milan Jovićević, Anđe Kapičić and Tatjana Jović, published by The National Museum of Montenegro, Cetinje in 1999. Returning to the article and specifically the genealogical table for a minute, I note that Zeepvat and Rosvall list two daughters of Prince Boris of Montenegro, Milena, b. 2008, and Antonia, birth year not given, while An Online Gotha only mentions Milena. Has the birth of Antonia never been officially confirmed? I know that it is almost impossible to get any news or any information at all about the present head of the royal family, Prince Nikola, and his children and grandchildren. With no male heirs (after Boris) in sight, the house seems destined to die out with him. The article The November 1918 Abdications, part I by Bearn Bilker gives a presentation of abdications of Emperor Wilhelm II and the monarchs of the various kingdoms, duchies and principalities of the German Empire. It was a good idea to write such an article, and I look forward to the follow-ups. I have never really understood the fascination for Sisi, the Empress of Austria (1837–1898). I think other members of the imperial family of Austria are far more interesting. But of course there are many aspects of Empress Elisabeth's life which are interesting to pay attention to, and the story of her property at Corfu, Greece, A Fairytale Palace on Corfu. I: The Achilleion and Empress Elisabeth of Austria by Stefan Haderer, is at least new to me and is worth reading. Last, but not least, The World Wide Web of Royalty column, is put at the end of the magazine again. The column lists genealogical news of the Imperial, Royal, Princely and/or mediatized families of Europe and this time we are treated with news from Austria, France, Reuss, Romania, Schönburg-Hartenstein, Sweden and Two Sicilies. Now I just have to remember to renew my subscription! Updated on Sunday 20 January 2019 at 14.15 (grammatical error corrected).